in suspension, with max. diameter of 25 mm. 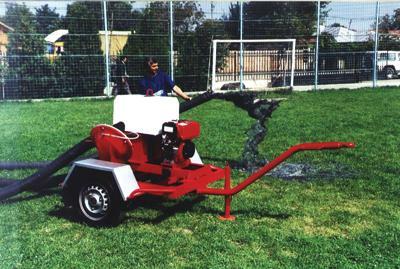 - district heating, drains, irrigations, etc. The operation principle is simple and base on the depression created in the pump body, which allows water suction by opening the ball valve placed on the inlet circuit, while closing the valve on the outlet line at the same time. The two membranes of the pump work alternately, thus allowing an almost linear operation at a constant flow rate. Pump starting is done manually, simply and safely. - max. flow rate: 50 m / h.
- pumping head: max. 15 m.
- suction height: up to 9.5 m.
- impurity size: up to 25 mm. 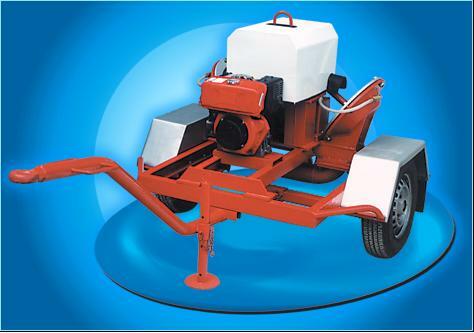 - engine: Diesel 5,4 CP or gasoline 5,5 CP. - consumption: Diesel-oil 1.0 l/h or gasoline 1.2 l/h. - in-out connections: ? 100 mm (4”). - sizes L x l x h: 2600 x 1200 x 1180 mm.